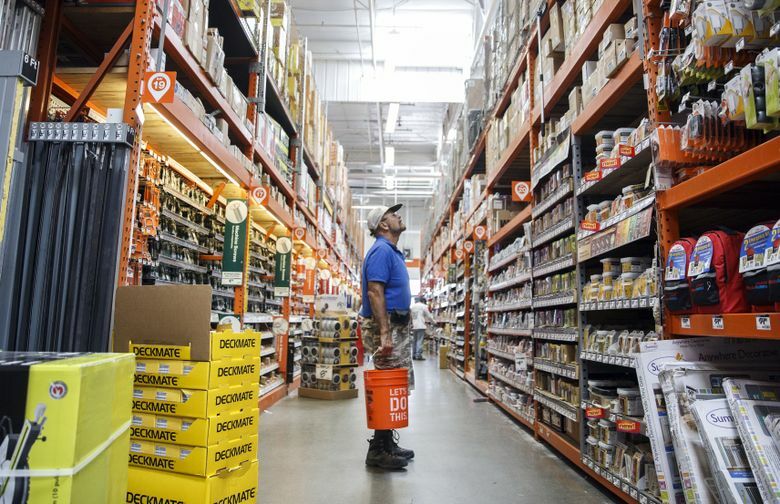 While other retailers are closing thousands of stores this year, home improvement stores like Home Depot and Lowe’s have seen boosts in revenue within the past year — and a major reason is the shortage of new single-family houses in the market, some experts say. DAYTON, Ohio — Americans are spending more money on home repairs than ever before, helping home-improvement retailers ward off the negative impact of online competition seen with other retail stores. Some homeowners are opting for additions to their existing houses or investments in major home-improvement projects. U.S. consumers will spent a record $316 billion on remodeling their homes this year, according to the Harvard University Joint Center for Housing Studies. That’s an increase from last year’s $296 billion spent on home improvement, and the $222 billion spent in 2009 amid the Great Recession. “Home improvement could be a bright light in the retail sector with remodeling projects on the rise and consumers more confident about investing in their homes,” said Ray Walsh, CEO of Market Force Information. HomeAdvisor found that the average household expenditure on home renovations increased by about 57 percent in the past year, and that’s helping home improvement stores thrive. The two home improvement business giants — Lowe’s Companies and Home Depot — have both reported increased sales for the first quarter of 2017. Home Depot posted sales of nearly $24 billion for the first quarter of 2017, a 4.9 percent increase compared to the same time in 2016. Based on its year-to-date performance, the company reaffirmed its fiscal 2017 sales growth guidance and expects sales and comparable sales will both be up about 4.6 percent. Stephen Holmes, spokesman for Home Depot, said the chain focuses less on low inventory in the housing market and more on home values. When homeowners feel their home is worth more in the current economic climate, they’re more likely to invest in larger projects like a kitchen remodel or making an addition onto the house, he said. “When people feel they have good value in their home, they’re more likely to see home improvements as an investment rather than an expense,” he said. The chain started thinking about its online strategy back in 2007 — making a strategic effort to move toward an “interconnected retail” presence. The chain found that about 40 percent of online orders are picked up in stores. Of that, more than 20 percent of those customers make an additional purchase while they’re in the store. Beyond homeowners making frequent stops to their local home-improvement stores, the major chains are also looking to cater to contractors and building companies that are busier than ever. With low inventory of residential real estate for sale, buyers are either remodeling their current homes or turning to professionals to build their dream homes. As other retailers shed assets, Home Depot also announced earlier this month that it agreed to purchase Compact Power Equipment for $265 million. Compact Power Equipment provides equipment rentals at more than 1,000 stores, and also provides maintenance services at stores like Home Depot. Lowe’s also acquired a company, Maintenance Supply Headquarters, in late June for $512 million to “deepen and broaden its relationship with pro customers and better serve their needs,” the company said. Sales for the first quarter increased nearly 11 percent to $16.9 billion from $15.2 billion in the first quarter of 2016, and comparable sales increased 1.9 percent. “A solid macroeconomic backdrop, combined with our project expertise, drove above-average performance in indoor projects. We also continued to advance our sales to Pro customers, delivering another quarter of comparable sales growth well above the company average,” said Robert Niblock, Lowe’s chairman, president and CEO.